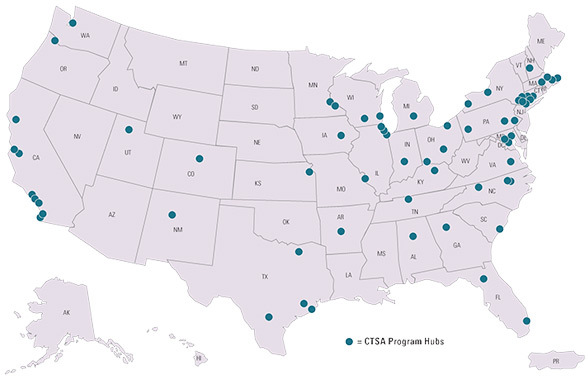 With support from the National Institutes of Health (NIH), the Clinical and Translational Science Award (CTSA) program launched in 2006 and has expanded to over 60 academic medical institutions across the country. The National Center for Advancing Translational Science (NCATS) was created to speed up the process of medical discovery and dissemination. NCATS strives to develop innovative solutions to ensure translational research (new drugs, treatments, or therapies) can get to patients faster, cheaper, and more effectively. The goal of the consortium is for CTSA institutions to work together to transform the local, regional, and national environment to increase the efficiency and speed of clinical and translational research across the country. The University of Iowa ICTS received the Clinical and Translational Science Award (CTSA) in 2007 from the NIH National Center for Advancing Translational Sciences and is just one of many locations across the country working to speed the translation of research into improved patient care.